I had a great, ink-filled day today! This morning I taught our first Technique Tags class, featuring Distress Stain. 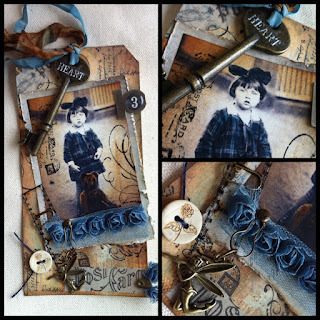 It was a lot of fun and I'm already looking forward to the next one :) Some of the ladies stayed for our afternoon 12 Tags Drop In, where we each did our versions of Tim Holtz's June tag. I took a photo of them all to share with you, but it's blurry :( so hopefully Janet's turned out better and she'll share on her blog! I won't go into much detail here, since Tim shows the steps so well on his blog! Here's a closer look at some parts of my tag, though. 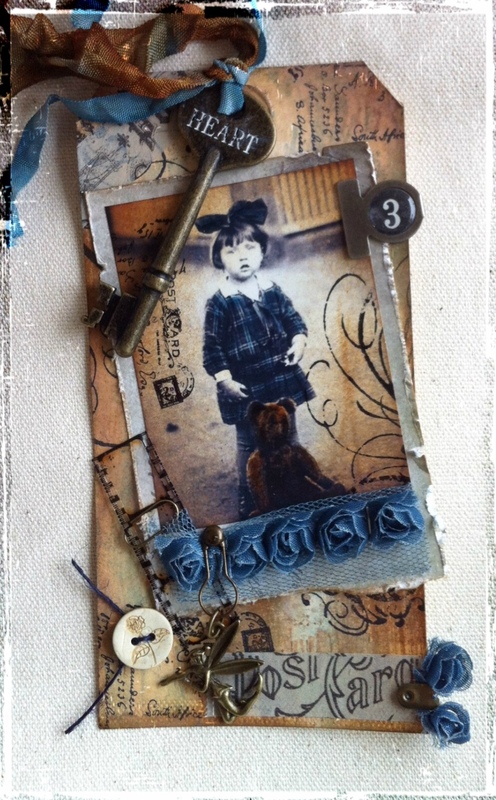 The blue ink & Distress Stain I used for my tag was Stormy Sky, I really love it together with Vintage Photo! I'm having a fantastic time with the 12 Tags of 2012- it's so enjoyable to get together and create something like this each month! Thank you for your compliment on my Craftchaos Blog on my June tag! Your tag is wonderful too. I love using the pictures on the tag. Your blue flowers are a wonderful addition. I love your tag, that blue really works so well! I think I have to go shopping now, I hadn't seen that color before! Thanks for stopping by and leaving your kind words for my tag! I think this is my favorite of his tags so far, and I love the Stormy Skies colour you chose, so pretty! Wish I could've made it, but I had soccer right at noon, kind of broke up the day! Maybe next month? Congratulations on being a June Winner..I am happy for you..Your tag is great, and those colorful ones waiting to be decorated are cool! I'm back!!! Your take on Tim's tag is fabulous! I love love love the denim rosettes! Fabulous! Congrats on your win! Congrats on winning June! Your tag is gorgeous! Many congratulations on your win, your tag is beautiful! Congratulations on being a winner. 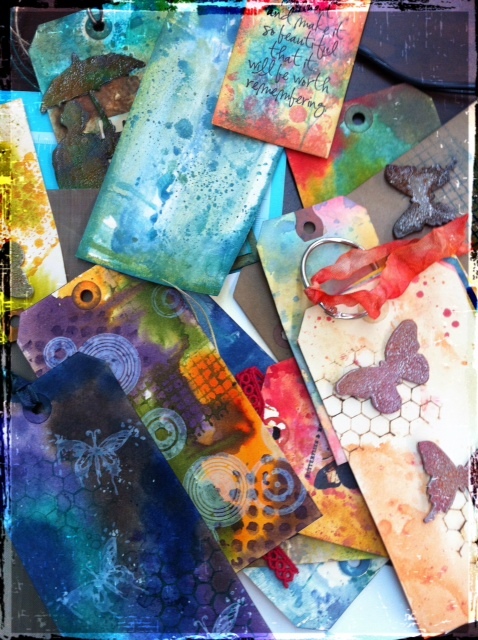 The tag is beautiful with the colors you used! Stunning tag! I love the blue paired with the brown. Stunning! Congrats on you winning tag! Enjoy your goodies.